If you relate to any of the above scenarios, then a fully automatic turntable may be the right product for you. Record players can be expensive. The good news is that you can find some decent automatic turntables under $200. In this article, I compare 5 fully automatic turntables and tell you which one is, in my opinion, the best one in this price range. I researched many automatic record players under $200. I selected the most popular and the ones with better ratings. I considered the most respected brands. I only included turntables with magnetic cartridge. I read tons of reviews, forums and consumer comments. Finally, I read all the user guides to get a good idea of which one could be the best option for you. I went through all that hassle so don’t have to. I hope you find this article useful. You can always leave a comment if you think you have some information that could benefit others. Keep on reading for the detailed information. I present to you our 5 contestants followed by a nice comparison table. Below the table, I’ll give you specific information on each product. At the end of the article, I’ll share with you my final verdict. All 5 turntables have pretty much the same features. So I decided to list those features here to avoid repeating information. Latter I will focused on aspects that are specific to each model. All 5 players support the same Audio-Technica ATN3600L replacement needle. Fully automatic. Just press the start button and the needle will be automatically positioned to play at the beginning of the record. When the needle gets to the end, the arm will return to its rest and the platter will stop spinning. Speed button selector for 33&frac13; and 45 rpm playback. You cannot play 78 rpm records on any of these turntables. No volume control, so the volume most be controlled through your receiver or power speakers. All of them have short cables. All of them need speakers and/or a receiver to work. All come with a 45 rpm adapter for 7” records with the big hole in the middle. 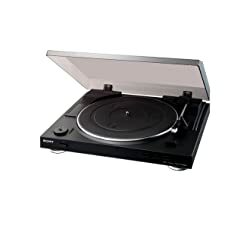 As you can see, in this price range, you won’t find automatic record players with detachable cartridges, counterweight and anti-skate features. This means that they cannot be upgraded. But at least, all of them have a decent moving magnet cartridge with a replaceable stylus. Don’t expect to get a sound quality comparable to a High End Audiophile record player but acceptable for the average listener. In my opinion the AT-LP60 this is one of the best turntables for somebody new to vinyl. Because it’s easy to use and setup, and for the price you get a very decent sound quality. It has PHONO and LINE level outputs via RCA cables that are hardwired. It has a preamp selector for this purpose. The cables are short, so expect to spend a little more on extension cables. This turntable has a tonearm lift button that allows you to manually position the tonearm. Very helpful if you want to play specific tracks or if your record has a nonstandard size. This unit comes with 3.5 mm female and male jack adapters, for different audio connection setups. The tracking force is factory set at 3.0 grams. So, your records can be safely played on this unit. Audio Technica is a well respected brand and they have an outstanding customer service. This turntable shows many high consumer ratings. PHONO and LINE RCA outputs with preamp selector. Comes in different colors: black, silver, red and blue. Be aware of the different prices, the silver is the cheapest at the time of writing this article. 3.5 mm female and male jack adapters. As you have already guessed. This is exactly the same model as the AT-LP60 with the exception of the USB port. This turntable is advertised as an “LP-to-Digital Recording System”. It comes with Audacity, an open source audio editing and recording tool. You don’t really need the CD because you can freely download the latest version from their website. Many consumers have complaint about Audacity being too complicated. Don’t worry about the software, you can use your favorite recording software. The record player is what interests us here. This model is more expensive than the one without USB. However, the signal coming out of the USB port is very low. 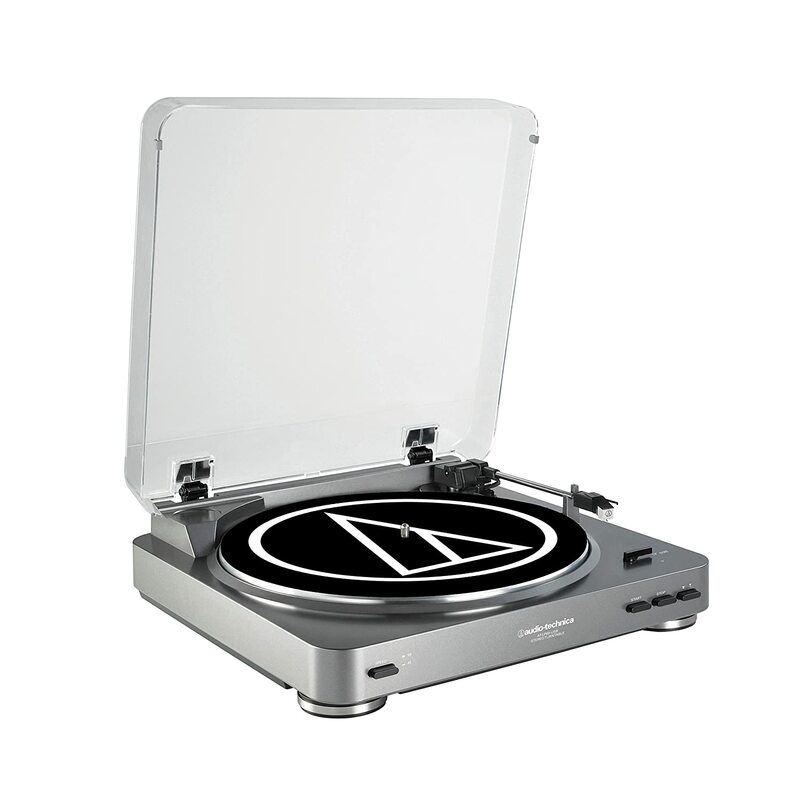 If you like this model, I would suggest you consider buying the AT-LP60 without USB instead and save you some bucks. You can always digitize your music by connecting your player to your computer with the 3.5 mm adapters that come with it. Sony is a well known brand in the audio industry. The PS-LX300USB is very easy to setup and easy to use. This affordable turntable has a USB port for transferring your music to a computer. It can be used to digitize your vinyl collection. It comes with Sound Forge Audio Studio LE, a commertial recording and editing software by Sony. Many consumers don’t like the recording software that comes with this unit. If you are not familiar with audio recording software, it make take you some time to learn it. This should not stop you from buying this product, because you can use any recording software. There are many out there. Check my review on the Audio Technica AT-LP60 USB. There you’ll find a list of audio recording tools that will help you digitize your music. The PS-LX300USB has a preamp switch on the back for selecting PHONO or LINE type of output. It has an RCA cable hardwired to the unit. It also has a UP and DOWN button that lets you position the tonearm manually if you so desire. Very useful for playing specific tracks. The PS-LX300USB has some negative reviews, but most are due do to the software. Some consumers have complained about the durability of this player. Another reported issue is that the motor may slow down with heavier and thicker records like 180 and 200 gram ones. The PL-990 has excellent ratings. Pioneer is a trusted brand and this turntable has been around for many years. If you need a durable turntable, this is the one. Some consumers that have tried both, the Audio-Technica and Sony have liked the Pioneer PL-990 better. One feature I like about the PL-990 is the speed adjust that lets you fine tune the rotational speed of the platter which directly affects the pitch of the sound. It has a stroboscope window, with patterns that help you calibrate the speed. This feature is used in combination with the speed adjust knob. This is the only automatic turntable under 200 with this feature. This player doesn’t have a USB output. It has a built-in preamp that cannot be bypassed. It means that you can only connect this turntable to a LINE/AUX input. It doesn’t have PHONO level output, which should’n be a problem for the majority of users since most modern receivers don’t have a PHONO input. The PL-990 comes with an elevator button for manually positioning the needle. This is useful for playing single tracks or if you have a non-standard sized record. The tracking force is factory set to 3.5 grams. The only problem with this turntable is that it has difficulty playing records that are slightly bigger or not perfectly circular. The arm rest and the left corner are raised in such a way that prevent some larger records from playing. The Denon DP-29F turntable is very easy to use and quick to setup. It has a decent sound considering its price. It has a preamp on/off switch underneath the platter which means that it can be connected to either a PHONO or a LINE input. It doesn’t have a USB connection, but you can connect it to your computer directly to the sound card. What I like about this unit is that it comes with a ground wire. This will help you reduce a possible hum noise caused by an electric ground loop. The Denon DP-29F record player has less than 0.15% wow and flutter according to the spec sheet, compared to the 0.25% present on the other turntables. 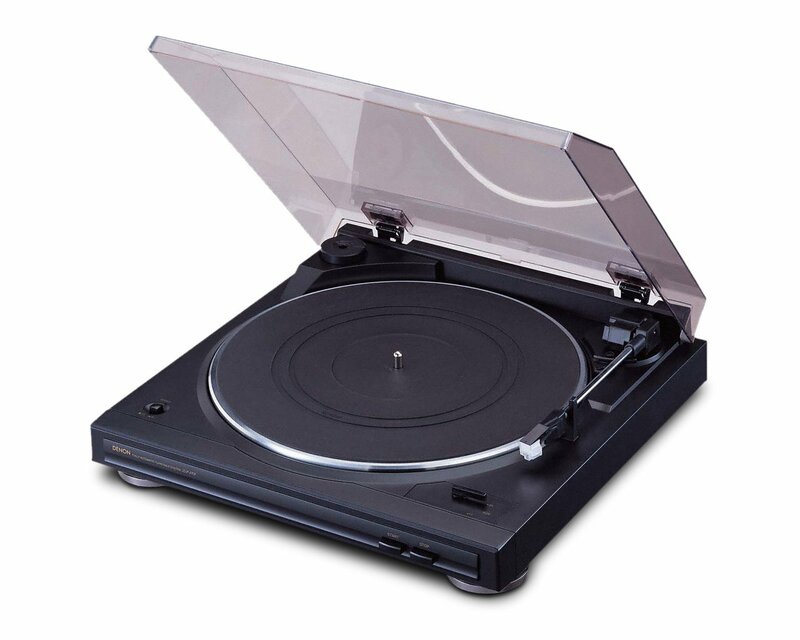 Among our featured turntables, this one has the lowest ratings. One important drawback is that it does not have a manual arm lifter or elevation button. This is very inconvenient for an automatic turntable. It makes it difficult to play individual tracks or play non-standard size records. Users that have compared this one with the AT-LP60 prefer the Audio-Technica. Many faulty units have been reported and some haven’t last more than a year. 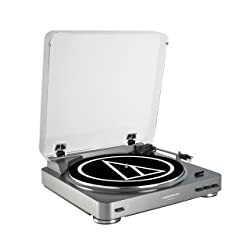 In my opinion the best automatic turntable under $200 is the Audio-Technica AT-LP60 because of it’s price, popularity and excellent ratings. Plus, this product comes in different colors. And finally, because Audio-Technica has an outstanding customer service. However, I would also consider the AT-LP60 USB for people that need the USB connection. I personally can live without the USB port, so I would rather save some bucks. 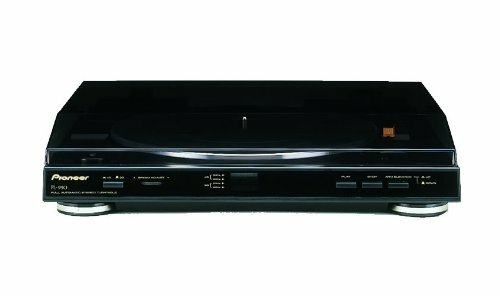 Although our winner is the AT-LP60, I would seriously consider the Pioneer PL-990. Specially if you need the speed adjust feature. I hope you found this article useful. Thanks for reading and don’t forget to leave a message. forgot to mention above, the pioneer also has a few options to upgrade the cartridge. I would love to have some information about that. If you could elaborate, I would appreciate it. The cartridge is fixed to the tonearm, so I don’t see how you can upgrade it. You could probably install a better stylus. But if you have that information, we will all benefit. great write up. But i got the impression the PL-990 have the edge. unless the “can’t play bigger records” is a problem with anything but the-most-exotic-records, then there is absolutely nothing that makes it worse than the audio technica. why is the audio technica the recommended one? Thanks for commenting. You are right, most records fit well. I think both automatic turntables are great. In fact, the PL-990 is the only one with the speed adjust feature and strobe dots. I recommend the AT-LP60 because it has better consumer ratings than the Pioneer PL-990. The other reason is because the AT has a pre-amp switch in case you want to use a better pre-amp to improve sound quality. AS I said, the Pioneer PL-990 is also a great option and the time of this reply, it’s cheaper than the AT-LP60. The table you have listed has the USB feature swapped between the AT-LP60 and the AT-LP60 USB. Nice review. One note: There is no such thing as “high or low” tracking force — only appropriate tracking force. A stylus riding too light in a groove can cause as much damage to a record as too heavy. The implication that the “lighter” tracking force applied by the AT units as being a pro is not an advantage over the other units if their tracking weights are set to the specifications of the manufacturer. Thank you very much for your enlightenment about the tracking force. You are right, the manufacturer specifies the appropriate tracking force. They are the ones that know what’s best for the proper working of the unit. Mmm… that gives me something to think about during the weekend. I’ll modify the post to reflect that idea.